The Shootaround gang is here to break down all the story lines going into today’s Game 1 of the NBA Finals between the Oklahoma City Thunder and Miami Heat. Is This (Finally) LeBron’s Year? and in his case, poor West only made the mistake of crossing paths with the Russell Dynasty. So if LeBron James loses his third straight Finals (2007, 2011 and, now, 2012), that would make him the unluckiest, least successful superstar since West. even if the general public and the gambling public are leaning toward Oklahoma City, a precociously fearless team that’s been looking admittedly ’91 Bulls-ish these past few weeks. Just remember, it would be a historical fluke — repeat: a historical fluke — if the greatest player of his generation went 0-for-3 in the Finals. Of course, he won’t make it easy because LeBron James never seems to make anything easy. That’s why I am picking Miami in a grueling seven-game classic. Kevin Durant, your time will come. Don’t care if they guard each other, yap at each other, or avoid one another. I don’t care whether Mario Chalmers or Daequan Cook winds up hitting the winning shot in Game 7 or Shane Battier’s defense is the most important factor in the series. I cannot be bothered about where one decided to go as a free agent or where the other decided to max out and settle down. If you’ve watched basketball over the past two weeks, you know these are the two best players on earth. KD’s Game 4 against San Antonio. LeBron’s Game 6 against Boston. These two have been on a collision course and now the crash is finally here. What do you say when someone gives you something so special? Thank you, NBA! Russell Westbrook and Dwyane Wade are going to guard each other. Not consistently, maybe, but it’s going to happen at some point, because Mario Chalmers can’t stop Westbrook and Thabo Sefolosha only plays 20 minutes a game. And when it does happen, it’s going to be terrifying. Everyone’s talking about LeBron James and Kevin Durant, and with good reason. But James and Durant are basically nice young men who happen to be very good at basketball. Wade and Westbrook are, by contrast, demons who have assumed human form in order to slake their thirst for devastation on the basketball court. Stylistically, they’re surprisingly similar, bowling-ball guards who hurl themselves at the rim across space and time. Temperamentally, they’re opposites — Wade a contemptuous aristocrat coolly wrecking peasants, Westbrook an enthusiastic experimenter with drugs he invents in his basement. Glasses-wise, it’s not clear they can exist in the same room without someone getting hurt, or possibly spontaneously developing 20/0 vision. “I can see clearly now, because I didn’t need prescription lenses in the first place,” Johnny Nash sings faintly, before they decapitate him. Wade has had a fairly miserable run/hobble through the playoffs. Westbrook’s been playing the best basketball of his career. Both teams need their top guards at full LIL SIDEKICK OF DOOM levels to feel good about this series. Miami needs Wade to get in the paint and keep LeBron from having to score 70 a game (possible, but inconvenient); OKC needs Westbrook to keep improving his turnover ratio while running an offense that’s been getting varied and unpredictable contributions from a wide variety of players. There’s going to be a moment when they guard each other, Wade looking cold as marble, Westbrook’s needle quivering at 9 million rpm and his pupils turning red. And oh man, I can’t wait. Is this the first all-Zombie Finals? Of course, there are the Zombie Sonics. But what about LeBron? Isn’t it clear what happened between Games 5 and 6 of the Eastern Conference finals? His affect flattened, he started staring off vacantly into the distance, he played with superhuman, almost ironic detachment. Zombie vs. Zombie: It’s the NBA Finals! shootin’ 3s” it read. Well, I guess now we know why. Jeff Van Gundy brought up the point several times during the Heat-Celtics telecast, and in retrospect, it’s silly that not everyone had the same thought when Bosh went down against the Pacers. Chris Bosh is an All-Star. With what Wade and James did at times against Indiana, it was easy to slip into the mind-set that when those two lock into NBA Jam mode, little else matters. They could be playing with anyone, and frankly, Ronny Turiaf is anyone. Bosh’s Game 7 Eastern Conference finals performance was a reminder that not only is he a necessary piece to a Heat title, but against both Boston and Oklahoma City, he might be the deciding factor. Most of Bosh’s offensive game is a known commodity. He’s a skilled big who has an excellent jump shot to 20 feet, an elite pick-and-roll player, and a very good offensive rebounder. The 3-point stroke he displayed in Game 7? 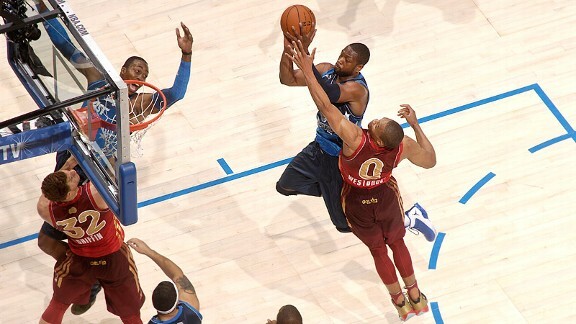 That was new, and while the 19 points Bosh put together on Saturday were nice, it’s the threat he may pose out there that can cause fits for OKC. Using Bosh as a screener/3-point threat (an idea for which Heat coach Erik Spoelstra doesn’t seem to be getting enough credit) opened up the rest of the Miami offense in a way that it had struggled to against the Celtics. When the Heat went small with Bosh at the five and sitting in the corner, it prevented Kevin Garnett from playing the normal defensive center field that he’d been allowed to play all series. Instead of helping hard off Turiaf, Garnett was forced to give Bosh some credence as a 3-point threat, and the result was James running wild in the paint throughout the fourth quarter. Oklahoma City has more lineup options and paint defenders than Boston can throw out, but against Miami’s Chalmers-Wade-Battier-James-Bosh lineup, the Thunder will likely be forced to go small as well. That leaves Serge Ibaka as the lone post defender, and if Bosh can consistently put together what he did in Game 7, it may leave none at all. The Oklahoma City Thunder and Miami Heat are evenly matched, and that means we are going to see a number of close games. Close games means we are going to have hotly contested fourth quarters. No matter what anyone tells you, these fourth quarters aren’t going to be one-on-one contests between LeBron James and Kevin Durant. In each of the Conference finals, both the Thunder and the Heat showed us new sets — one from each that we haven’t seen all season long — that were incredibly difficult to stop (and, interestingly enough, both of which have their best players working off of the basketball). Whoever can stop the other’s “unstoppable” set will put themselves in a position to win games late, and eventually win the series. Here’s how each team could try to do so. The play above is Oklahoma City’s pin-down set. It features James Harden with the basketball as Russell Westbrook sets a pin-down screen for Kevin Durant. What makes this so tough to defend is that you have a point guard setting a very good screen for Durant, freeing him to get the basketball open at the top of the key. In the clip above, the Spurs try to switch this screen, but because Westbrook is a point guard, the result is Tony Parker covering Durant. With that being said, the switch is going to be the best way for the Heat to counter this. The reason? LeBron James is probably going to be covering Durant. Either Dwyane Wade or Shane Battier will be defending Westbrook. Either of those players (Wade or Battier) can handle Durant (as much as anyone else in the league), so that huge advantage the Thunder are creating with a point guard covering Durant is gone. Instead of James trying to fight through Westbrook’s screen and giving Durant space on the catch, switching is the best option. Miami’s late-game play is a little different. Starting out in a “horns” set. Wade is usually the ball handler at the start of the play. Both James and Udonis Haslem run up and set a ball screen on either side of Wade. What makes this so tough is that the man covering James needs to be aware of him at all times and it doesn’t matter if Wade uses his screen. In the play above, that’s exactly what Kevin Garnett does. He’s burned as Wade splits the defense and gets to the middle for a dunk. So how does the defense counter this? Whoever is covering Haslem needs to hang back around the free throw line as the screens are being set. If Wade uses James’s screen and gets through the defense, LeBron’s man can stay home while Haslem’s man clogs the middle. The same thing happens if Wade uses Haslem’s screen. You have to give something up playing like this, and you are giving up a Haslem pick-and-pop jumper, but you’d rather have that than James or Wade getting open. It seems like those odds should be a lot higher, right? This is one of those bets that the Vegas sportsbooks can’t post because it has a very arbitrary (and even vague) description at the helm. Is it only game-winning if the opposing team doesn’t have time to inbound the ball after the shot goes through the hoop? And what if you make the shot, time expires, and the refs go check out the replay and put three-tenths of a second back on the clock? That would be an incredible bummer. It could be fun to parlay this with some of the game-specific prices. If you assume that James won’t have a game with 38 points or more, you’re probably also assuming that you’ll end up seeing a short series with the Thunder winning, so you could combine this bet with one on the Thunder winning in four (9-to-1) or in five (6-to-1). This bet doesn’t specify that the player has to be on the Heat or Thunder, right? Or that it even has to be a basketball player at all? Quick, Andriy Shevchenko, drink this delicious Nandrolone shake! Even after every matchup and coaching strategy is scrutinized, the victor in this year’s Finals might well be determined off the court. After all, sports history is full of cautionary lore about athletes who partied too hard or became entangled with a prostitute who lacked a heart of gold. Here are some of the perils awaiting road teams during this series. Miami: Arguably the most famous discotheque in the United States, Club LIV boasts boldface regulars like Lil Wayne, Drake, Rihanna, and Nicki Minaj. When the Dallas Mavericks celebrated their title at LIV last season, Chris Bosh watched from the shadows, drowning his sorrow in Shirley Temples. Oklahoma City: According to the City Walk website — which conveniently offers options for both high- and low-bandwidth users — the 30,000-square-foot behemoth is Oklahoma City’s “Premiere Multi-Club Complex.” OK, whatever, but we’re enthusiastic about the fancy spelling of “Premiere.” Apparently there are seven areas, including one with dueling pianos. But on Yelp, reviewer Rc W. raised questions about the quality of the women, calling them “bottle blonds with outdated skanky clothing and cake makeup who spraytan so much that they look like freaking Oompa Loompas.” And Mike Miller will be very disappointed when he learns the dueling instruments are not banjos. Miami: Birdman and every rapper. Plus incorrigible temptress Gloria Estefan. Oklahoma City: Chuck Norris. More annoying than his own annoying Internet meme. 100. Will playing in the NBA Finals finally make an NBA fan out of Food Network devotee Shane Battier? 101. After last year’s finals, photographer Ari Marcopoulos made a zine about Tyson Chandler. This year, James Jones has become the unlikely patron saint of Miami’s chillwave scene. Actually, if you think about it, this totally makes sense. The best parts of that video are the surveillance video-like clips of James Jones asleep on a fishing expedition. 102. Not to be outdone: the Chris Bosh Film Festival, featuring some mesmerizing Photoshop and GIF art, an uncredited cameo from Lucas Leiva, post-ironic use of Comic Sans, and a Bosh ouroboros. NBA Finals Preview: Can the Thunder Beat the Heat?